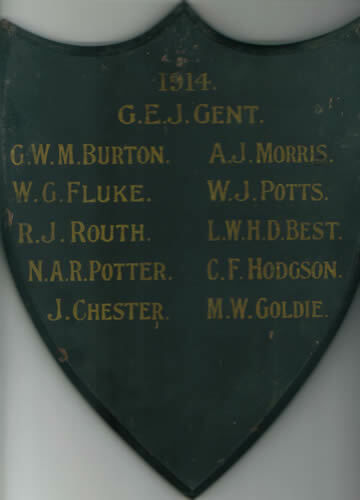 Cricket XI 1914 Geoffrey Burton, Cyril Hodgson and William Janson Potts were to be killed in the War. The King’s School in the early twentieth century was very small compared to today. In the Trinity (Summer) Term of 1914, there were 148 boys in the Senior School – 96 in the upper school and 52 in the lower school. There were also 48 boys in the Junior School making a total of 196. Just over 150 were boarders. For the senior school, the Mint Yard was “the centre of all things”. On the Northgate side were the laboratories, the Parry Library with classrooms underneath, the fives courts and the gymnasium. School House had studies on the ground floor with dormitories above. The Headmaster lived in the future Galpin’s House. The Schoolroom was used for morning assembly, and noticeboards were in ‘the Arches’ underneath with the tuck shop in what later became the Memorial Chapel. The Grange contained dormitories for some School House boys, as well as masters’ accommodation and classrooms. The Junior School was in today’s Walpole House. It had its own classrooms next to it, and a new classroom block (now the ‘J’ block) was opened in 1914. Hodgson’s Hall (25 The Precincts) was the school sanatorium. The ‘school chapel’ was in the south transept of the Cathedral and was used for the services on Saturday and Sunday. The Chapter House was used for Speeches. There were two boarding houses in the Old Dover Road: Langley House and Holme House. The Green Court, with the grass surrounded by iron railings, had been the School’s ‘playground’ since at least the seventeenth century and was still used for cricket practice and other small scale activities. Tennis courts were behind the Grange. Major sports took place elsewhere. Blore’s Piece was the main rugby ground, but the School also used ‘Cullen’s’, a field in nearby St Stephen’s. The cricket 1st XI played its matches on ‘the Beverley’, as the boys continued to describe the St Lawrence Ground. Sports Day had also moved there from the Green Court in 1902. Rowing was at Fordwich. The Headmaster was the Revd Charles McDowall, who had taken over from Arthur Galpin in 1910. He was typical of HMC Headmasters in being from Oxford University, a classicist and a clergyman. He was also responsible for teaching the Sixth Form. At Midsummer 1914 there were sixteen assistant masters, including the music and drawing masters.